If you are looking for a low maintenance work surface that is 100 percent heatproof for your kitchen consider a soapstone countertop. What makes soapstone a low maintenance material? Unlike other types of stones surfaces like granite or marble, soapstone does not need a sealer because it is nonporous, which makes it stain resistant—not to mention naturally antimicrobial. Do you love surfaces that develop a lovely patina with age? Then soapstone will not disappoint. Over time its charcoal gray surface will oxidize making it darker. While soapstone does not chip or crack easily, it can develop subtle dents and scratches in hardworking kitchens that can be buffed away or left to contribute to its natural beauty. To help you determine if the stone material is right for your kitchen, check out these soapstone countertop ideas. If you cannot decide between marble or soapstone countertops, this kitchen offers a smart solution. Brooke Wagner Design out of Corona Del Mar, California combines both types of stone in this contemporary cooking space. The soapstone counter around the stove is reserved for food prep while the marble countertop is primarily used for light kitchen tasks like washing veggies or serving meals. While many soapstone countertops spotted on Pinterest of Instagram appear to be one solid color, the material can also be found with veins or striking streaks in green, black, yellow, blue, brown, or white as shown in this kitchen by Ben Herzog Architect, out of Brooklyn, New York. Even the apron front sink with drain board is durable soapstone. Adding to the cooking space's vintage inspired charm, are the cabinets painted a retro shade of mint green. Soapstone countertops lend contrast to this crisp, white kitchen in an Indiana farmhouse renovated by Leo Designs, an interior design firm situated in Chicago, Illinois. Contributing to the cooking space's Americana vibe are vintage inspired fixtures including the overhead lighting. In a traditional kitchen chock full of oak cabinets, soapstone countertops add a rustic touch that feels more modern than classic. Whitten Architects out of Portland, Maine, picked the stone surface to coordinate with the stainless steel appliances. A veiny soapstone countertop is a gorgeous counterpoint in this glamorous, traditional kitchen by interior designer Meg Lonergan based in Houston, Texas. Adding to the cooking space's luxurious vibe are the gold cabinet knobs and turquoise range. If you need to create an additional work surface in your kitchen consider adding a kitchen island with a soapstone countertop. Here, Alice Lane Interior Design out of Salt Lake City, Utah does just that with a free-standing option that doubles as a dining table. You will find soapstone slabs in a wide range of gray tones like this cool pewter example found in a home by Frank Shirley Architects based in Cambridge, Massachusetts. Swirls of dark gray and white add a massive dose of visual interest to the stone surface. Fans of modern farmhouse style will love this black and white kitchen by Whitten Architects based in Portland, Maine. The countertops along the walls are durable soapstone, which as we already explained stand up to heat and stains making it the ideal work surface for busy cooking spaces. For a pop of contrast, the kitchen island features a stained wood topper. Nearly black soapstone countertops with matching backsplashes add striking contrast to this sunshiny kitchen by Heide Hendricks Interior Design based in East Hartford, Connecticut. Adding even more practical function to this bright yellow cooking space is the kitchen island topped off with a maple butcher block countertop. 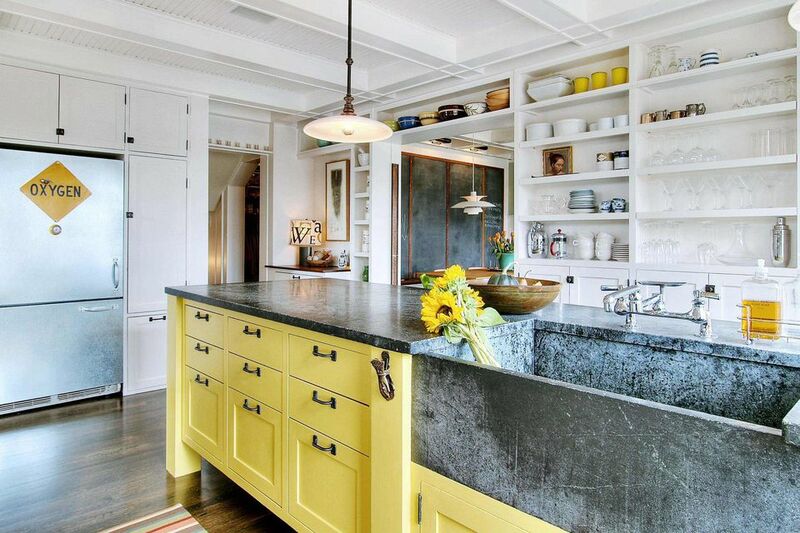 A soapstone countertop can sprinkle on some rustic character to a contemporary cooking space. Here is one of our favorite examples created by J.A.S. Design-Build, an interior design firm based in Seattle, Washington. A beautiful charcoal gray and blue soapstone counter lends old-timey country style to this modern farmhouse kitchen. For an objective opinion on soapstone countertops, we turned to Joan, the home improvement blogger behind the site For The Love of a House. She loves the stone, which she installed her own cooking space. She adds while it is a low maintenance material it still requires a little tender loving care to keep looking its best. For instance, her countertop has several small nicks around the edges of the dishwasher and sink caused by banging objects. She says to prevent it from happening in your home be a little mindful when it is time to wash pots and pans. If a real soapstone countertop is out of your price range, you can still get the look with Formica laminate. Here, Colleen, the décor blogger behind Lemon Thistle, went with a pattern called Soapstone Sequoia. She says her new laminate counters look as beautiful as the real thing. Colleen offers this tip: The best type of sink to combine with laminate is a drop-in as shown. Unlike an undermount sink, it will protect the investment you made in laminate with corners that offer protection from water. In this homey kitchen by Rauser Design based in Austin, Texas soapstone counters are combined with a butcher block chopping station. We love how this cooking space combines features in cool colors like the countertops and blue cabinets with warm wood accents including the kitchen table and hardwood floors. A midcentury modern home renovated by Annie Hall Interiors out of Cambridge, Massachusetts gets a spanking new cooking space that is in step with home's historic style. Turquoise cabinetry and warm wood walls are a classic midcentury combo. The boomerang-style kitchen island with a soapstone countertop is a nod to the traditional kidney-shaped coffee table, which is an icon of midcentury décor.